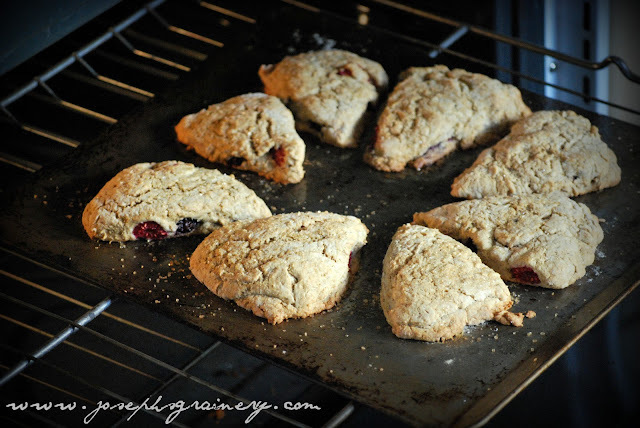 Berry Barley Scones fresh from the oven. There are several great blackberry patches along MaMa's and my jogging route. I ask everyday if we can pick blackberries. Yesterday was the first morning we couldn't find a decent blackberry to pick. I didn't understand, I've been picking berries of these bushes and enjoying their bounty for a couple of months now, how are they just "all gone", as MaMa keeps telling me? A week or so ago when there were still a few blackberries to pick, MaMa and I took our bowl with us on our morning run. That day we didn't do so much running, we did more picking (and tasting). MaMa had also received some Driscoll's Raspberries. 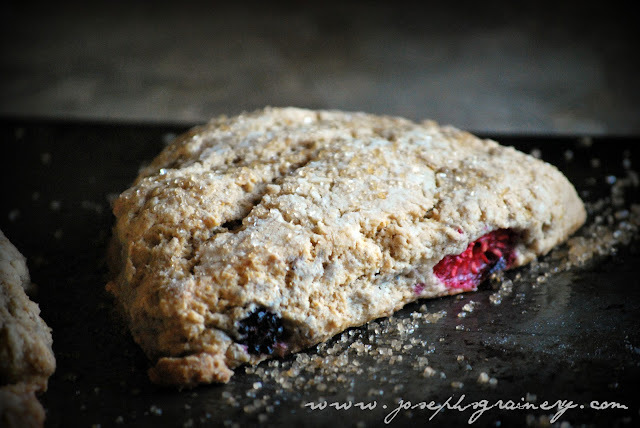 With their wondeful flavor and color, we thought they'd be the perfect pairing with our freshly picked blackberries to make barley scones, and they were. We ate these scones for breakfast and even snacked on them. A tasty and healthy treat for tea time. Sift together the dry ingredients into a large bowl. Using your hands, add the butter to the dry mixture and continue to cut it in until you have small bit the size of peas. In a small bowl, whisk together the buttermilk and egg, then add to the dry mix until it is combined. On a well floured surface, divide the dough into 2 pieces and pat each piece into a 7 inch disk that is about 3/4 inch thick. 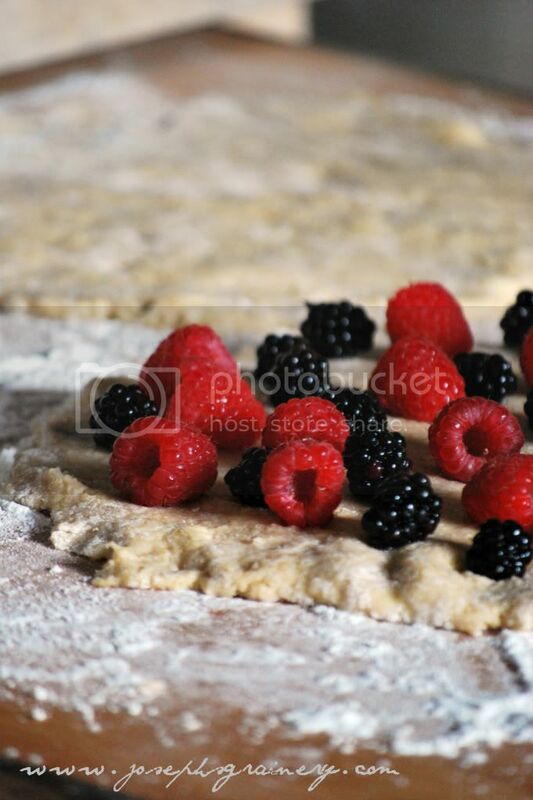 Cover one of the disks with fresh berries - as many as your heart desires and will fit. Place the 2nd disk on top of the berries. Coat with melted butter and cut the circle into eight triangular wedges. Place each of the wedges on a baking sheet, sprinkle sugar over them and bake for 22 minutes. Move to a rack to cool. Dough reading to be rolled. 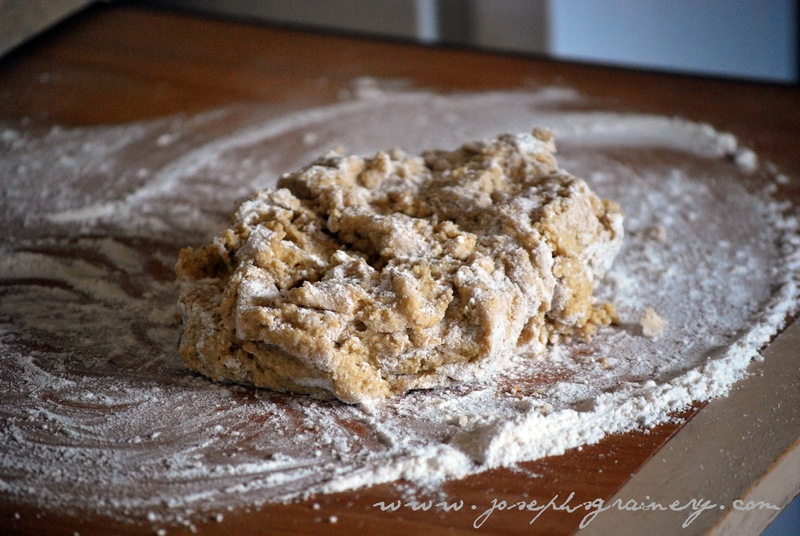 This recipe was inspired by one found in Good to the Grain by Kim Boyce﻿.